Red Mage: You just fell for the oldest trick in the book, Lich King! Thief: The one where you get three gullible suckers to make you their undisputed leader? Red Mage: You just fell for the second oldest trick in the book, Lich King! Lich: The trick where you put your soul into a gem so you can't be killed and instead become an invincible ruler of the dead? Red Mage: You just fell for the third oldest trick in the book, Lich! 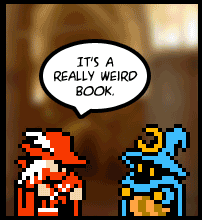 Red Mage: Okay, that is so not in trick book! The Oldest Ones in the Book of tricks. "Ursula": Actually, the oldest trick in the book is kidnapping a couple of teenagers, brainwiping them, waking them up in a prepared habitat, and saying, "I made you out of dust and I made her out of one of your ribs."